I would have reviewed this at the time, but I assumed it would be the first in a series of OVAs. In fact, a full series is now in production and has begun airing in the noitaminA slot, so this stands alone – and thus deserves a review. It was the first production made by new studio Ordet alone – they warmed up with a few co-productions first. The studio was founded after Yamamoto Yutaka’s much-publicised dismissal from Kyoto Animation as a scapegoat for the negative attention Lucky Star got in its first few episodes (which personally I felt were better than what followed). He founded Ordet and BRS will largely make or break them – though they’ve already more than proven their capacity to make impressive animated sequences. 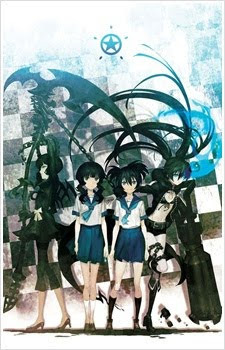 Black Rock Shooter was one of the most prominent of the songs by Supercell that really launched Vocaloid as a phenomenon. The song was written by Ryo after seeing some artwork on Pixiv by Huke, and it was the two deciding to collaborate that led to the formation of Supercell. It’s a rather cheery uptempo song with generic angsty lyrics, but a brilliant piece of pop songwriting, and also kicks off my favourite Nico Douga medley, Nanairo. Because it’s sung by Miku, the Black Rock Shooter character often gets conflated with her, but the design predates the association with Vocaloid and is quite distinct. This 50-minute OVA tells two stories in parallel. One is the rather abstract story of Black Rock Shooter whizzing about her chain-and-checkboard-themed world fighting against Dead Master. The other is about two girls meeting at the beginning of junior high and depite being like chalk and cheese grow very close. Our main character Kuroi (‘black’, rather un-subtly) is not academic but full of energy, while Takanashi (which sounds like ‘No hawks’ but is written with kanji that most would assume are written ‘Kotori Asobi’ – little bird playing) is bookish and a little stiff. They get on very well, but Yomi gets jealous when Kuroi gets a new friend, Yuu, which it’s implied allows Dead Master into her heart. Kuroi finds a strange necklace that allows Black Rock Shooter to merge with her and rescue Yomi – at least, that’s what seems to happen, but it’s never really explained why Kuroi and Yomi resemble their otherworldly counterparts so much from the start, or why Yuu appears briefly in that world. The designs are cute and the animation is mostly extremely nice, though some parts get a little sloppy where they ought to be bravura. While the plot is a little strange, that’s fine for such a short piece and it’s a great showcase of both the action and the down-to-earth storyline that can run with it. The series looks to be very similar, only rather than Yuu getting between the two it’s the rather over-the-top little rich girl in the wheelchair, and there’s even less link between worlds. But if anything, it’s more visually appealing, especially in the other world, and I’ll definitely watch on. Plus I like the new sung version of the song! I just watched the first episode last night of the full series. The fighting sequences are awesome. I'll probably watch the OVA after now. It's worth watching before the rest of the series, though you'll probably get the feeling of seeing much of the same thing twice. The action scenes were great-looking, weren't they? If rather random and unexplained. I hope they keep them up. Shame there'll be so few episodes.